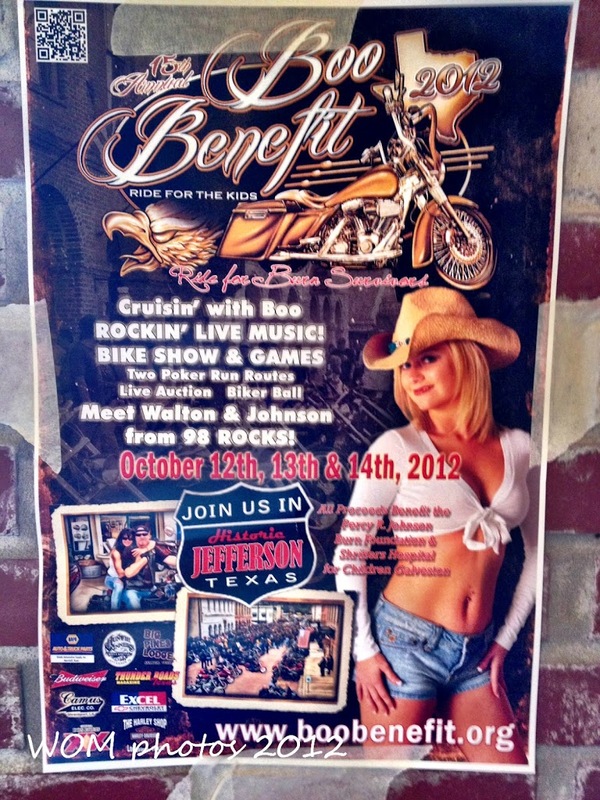 This year the Benefit is the weekend of October 12-14, 2012. Ride your motorcycle on into Jefferson for the annual event. There will be contests, a Biker Ball, two Poker Runs, a ride along with Boo, Motorcycle clothing and outfitter vendors, food vendors, Live Music and so many beautiful Bikes parked all around Jefferson it will make your head spin. And this year my favorite radio station; 98Rocks DJs Walton & Johnson will be joining Boo during the Meet and Greet on Saturday. Friday afternoon kicks off with a ride along our beautiful country roads escorted by Boo himself. In the evening have a blast at the Biker Ball featuring dinner, silent auction, music and door prizes. Get your tickets today. Some of the bands playing on stage this year include: Alan Fox Band, Dagnabbit, Testone Babies, Teazur, and Lady Chazz and the Tramps. We will post when we have more up to date information about the times of the events still being planned. At this time the White Oak Manor bed and breakfast is full but you might find other accommodations for the weekend by checking out the lodging page on the Marion County Chamber of Commerce or the Jefferson Visitors & Convention sites. This entry was posted in Biker Rally, Fall Events, Special Events by Tammy D. Bookmark the permalink.